Who remembers the Foursquare hysteria when everyone and their mother, quite literally, used to digitally check-in to any and every hole in the wall, provided it was listed? Whether it was truly about searching for new venues, browsing through visitor reviews, or amassing accolades for every check-in, review, and photo posted, I think we can all agree how pathetically duped we were. Hard work should be rewarded, ideally with tangible prizes. Otherwise, as with Foursquare, boredom and eventual withdrawal will ensue. Fortunately, the folks at Merits grasped that self-truth early on and wanted to do something bold about it. 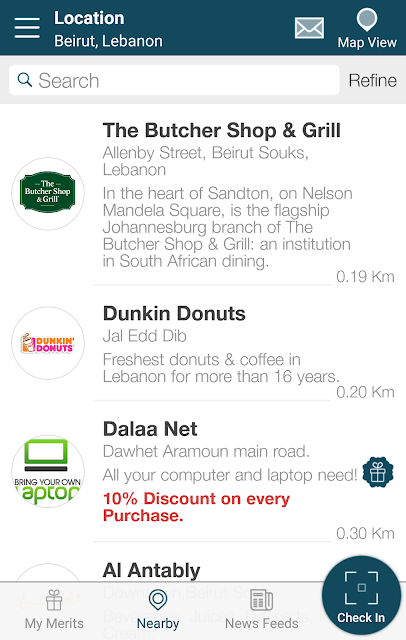 So they created an app to reward user loyalty with real incentives. It’s quite easy. Check in. Collect. Track. Redeem. First things first, download the app from the Apple Store or Google Play onto your smartphone. Registration is straightforward, and once you’re logged in, navigation within the app couldn’t be more seamless. There are three tabs at the foot of the screen. The first captures “My Merits,” or the points you accumulate by spending money at all participating venues. The second sorts “Nearby” venues in ascending distance from you, in list or map view. If the venue has a gift icon next to its name, it has a loyalty program in place via Merits. The third tab is a “News Feed” that briefs you on the various deals around town. Click on the “Nearby” tab, which has a search field at the top followed by a list of venues in ascending order of distance from you. Venues are accompanied by a thumbprint image or logo, exact street location, and a brief description of the sort of products or services they render. You can scroll down infinitely through the directory to find every type of vendor in the book, F&B or otherwise. If you decide to exploit the search tool, you can refine your search by applying filters such as category (e.g., restaurants), loyalty programs, special offers, new arrivals, and the like. 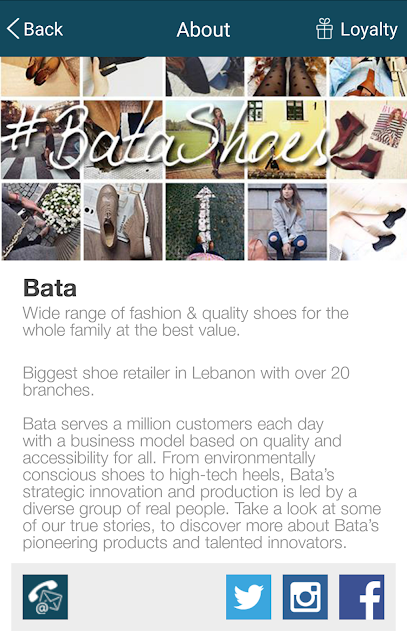 Enter “Bata” in the search field, and you’ll find two entries for both the Beirut City Center and Dbayeh locations. If you click on either, you’ll be taken to a profile page that tells you more about the shoe store’s products and services. Contact links (e.g., phone, email, and website) as well as social media accounts (e.g., Twitter, Instagram, and Facebook) are all displayed, and in the top right corner, the “Loyalty” gift icon spells out the details of point collection. Bata offers you 1 point for every 10,000 LL spent. 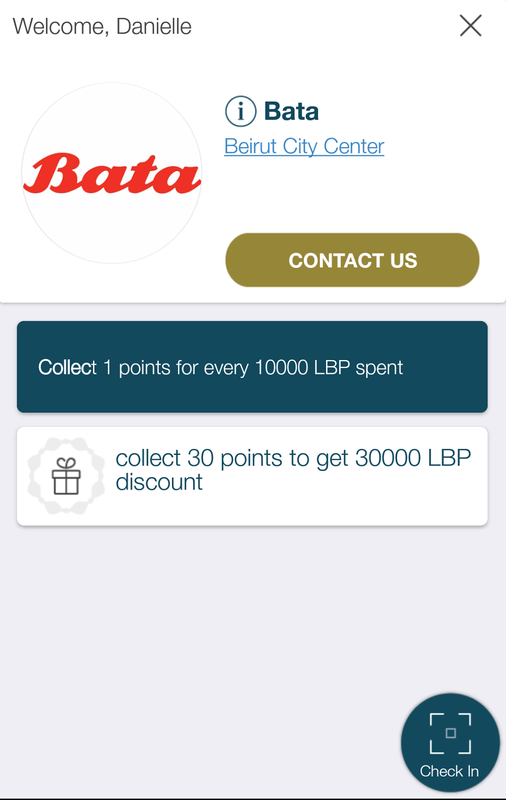 Collect 30 points to redeem a 30,000 LL discount. That’s equivalent to 10% off a purchase of 300,000 LL. 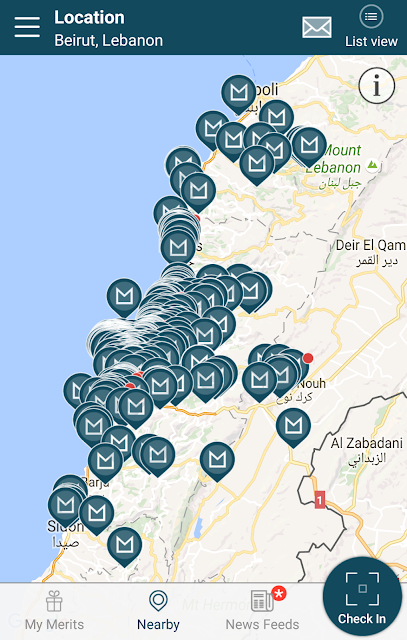 It should be noted that Merits is very new to Lebanon, so don’t expect to find all your favorite hotspots yet on the app. At present, 350 brands translating to a total of 450 branches have signed up. The hope is that over time, more and more venues like Classic Burger Joint and the like will catch on and advertise their services on this interface. In the meantime, chuck your Pokémon Go aside, and ready your thumbs for the ultimate check-in challenge. It's time to capture some legit savings. Merits first spread its wings in Canada and has since landed in France, UAE and most recently Lebanon. It offers businesses a platform to connect with customers and create effective marketing campaigns.